Life-altering changes are currently being made by the Thai government and Thai Union Frozen Products – changes that help to promote dignified employment. In mid-March, the Associated Press (a global news company based in the US) published a report that covers current human trafficking on Indonesian fishing trawlers (boats that use heavy nets to catch fish from the sea floor). By personally interviewing both current and former slaves from Benjina, an isolated island village where trafficking thrives, they gathered a horrific but realistic picture of what it looks like in the region - beatings, up to 22-hour workdays, deaths at sea. That’s not even the whole story; the male slaves spoke of being fooled, kidnapped, or sold like a piece of property into the trafficking business, and they live with little to no hope of escape. The fish they harvest are shipped to Thailand then taken by truck to different exporting and processing companies. The business is lucrative and not uncommon. A connection was revealed in the AP report between a trafficking-based supplier and Thai Union Frozen Products, which with annual sales of $3.5 billion is Thailand’s main seafood company. This public announcement, along with the US’s November 2014 crackdown on Thailand’s lack of progress in preventing slavery (Thailand received the worst possible rating on the annual Trafficking in Persons report), has produced a huge response from the country. Thailand has recently increased its legal penalties regarding human trafficking. 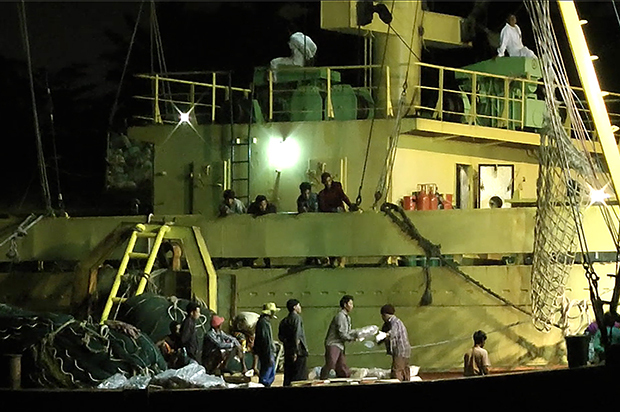 The country now allows prosecutors to push for harsher sentences for those involved in the business in the hope that it will discourage not only the business of trafficking as it occurs on fishing trawlers in Indonesia but also within Thailand’s own borders, where a migrant population of nearly 3 million often experiences abuse in their work and/or go undocumented. Similar to the government’s anti-trafficking response, Thai Union Frozen Products publicly ended its connections to its trafficking-based supplier, whose name they declined to state, shortly after the AP publication, an admirable and needed step. Thai Union said it this way: “Consumers can rest assured that our current products are not tainted with the alleged trade supplier… This is to prove that Thai Union takes the issue of human rights violation extremely seriously." This makes us wonder: if the companies - or even closer to home, the shoppers - were handed the fish they are purchasing at the grocery store by the beaten, exhausted, and enslaved workers who labored for them, would they look at their purchase in the same way? Wouldn’t there be a kind of natural instinct of conscience that would prevent the consumer from supporting that product? That’s exactly why awareness – and more importantly, action from companies just like Thai Union and governments – are so immeasurably vital to ending trafficking in our world today. Without constructive U-turns by groups with power, just like those being made in Thailand and in the Thai Union Frozen Products company, the fight to end slavery cannot succeed.